Arrange the orange-skin halves on two plates. Mix two packets of jelly crystals with 2 cup (500ml) of boiling water. This makes a very firm jelly once set. Pour the jelly carefully into each orange skin. Leave to cool and then place in fridge until set. 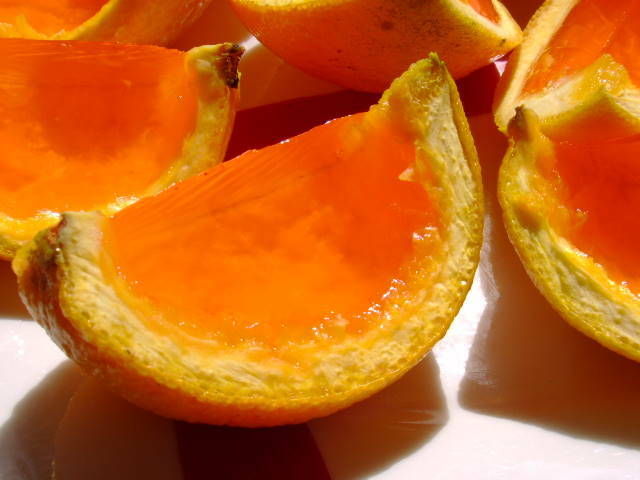 The next day, use a sharp knife to slice each jelly orange in half again - giving you very clever little jelly segments. For the Sports theme I used orange jelly to resemble actual orange quarters that soccer and rugby players have at matches. 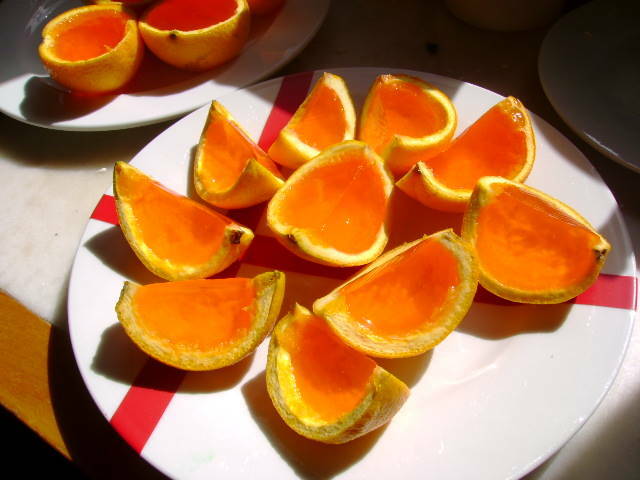 You can alternatively use other colours and turn the jelly oranges into little boats, as we did for the Deep Blue Sea (pirate) party. The sails are made from triangles of white paper threaded onto toothpicks. Dip the banana pieces into the lemon juice then roll in the dessicated coconut. The lemon Juice prevents browning and also helps stick the coconut on. The mix of flavours is divine! 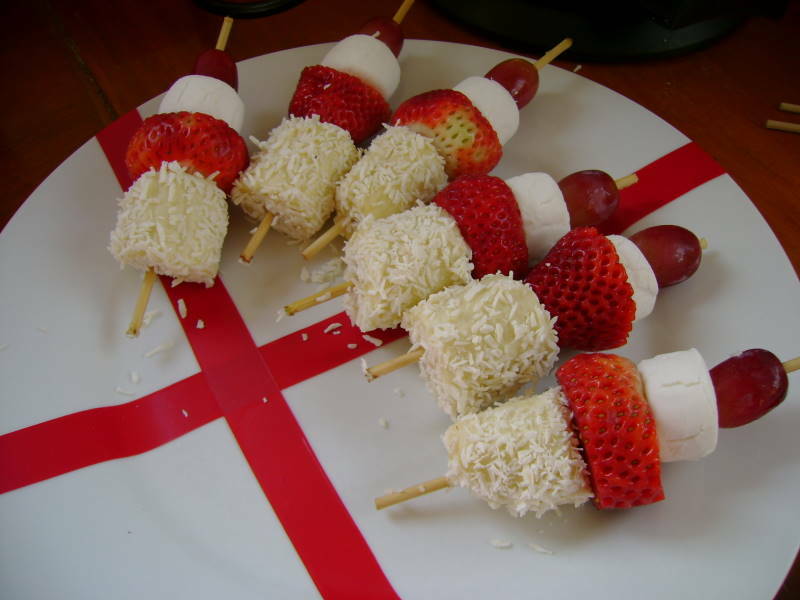 Thread banana onto the skewer, then add a piece of strawberry (or pineapple), a marshmallow and a grape. 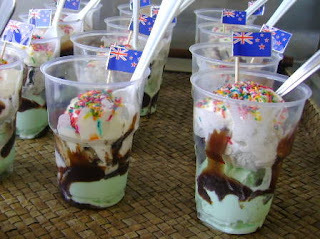 In clear disposable cups, put one scoop of green icecream and one scoop of brown; then pour on some chocolate sauce; top with a squirt of Dairy Whip and sprinkles. If you are really keen, make little flags like I did: Use a sheet of flag stickers and some toothpicks. Stick a flag on top! This is the easiest no creaming, no-fail recipe. I use it for all my birthday cakes. Double or triple it depending on the size of the cake tin you need to fill. Melt the butter and syrup in a microwaveable bowl. Add egg and sugar and beat well. Sift cocoa, flour and baking powder together and add into egg mixture. Dissolve the baking soda in the milk. Fold gradually into the mixture. Pour into a lined (or greased) baking tin. Bake at 190oC for 30 minutes or until cake springs back when lightly touched. Allow longer cooking times if you have doubled or tripled the mixture! For a roasting-dish-sized cake, I tripled this recipe. What a fun party!! Love it. Wishin I loved coconut more. This is the 2nd stop with coconut. Is there a substitute? So, jelly=jello? So fun that you have different words. That mud n grass sundae sounds amazing too. Thanks for linkin this to tasty tuesdays. How cute! I am going to have to try making some of these for my boys, they would love the orange slices! Ingenious! Especially the oranges with jello!